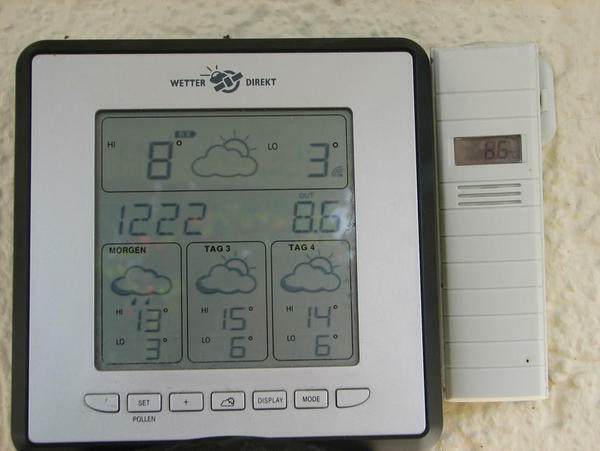 Weather stations with transmitters (Figure 1) are used in many households today, including my own. The small transmitter, in this case, is on the window sill, measuring weather data such as temperature, air pressure, and humidity and transmitting the results digitally to a base station, which then displays them. However, a base station is not even necessary for receiving the data. With a little passion for tinkering, and the help of software-defined radio, I can receive, read, and even produce this wireless data with my own computer. Software-defined radio (SDR) picks up electromagnetic waves almost directly at the antenna and uses software to process them. In the simplest case, an SDR-receiver consists of an antenna and an analog-to-digital converter plus software. Depending on the device, it can thus scan a very large frequency range. Applications for implementing SDR include GNU Radio, GNU Radio Companion, or Gqrx. The software does the majority of the work, so your soldering iron can stay safely in the cabinet. You only need to find the right hardware, which costs only a few dollars, as well as an editor to process the digitized radio data on your computer. The first step is to find the right reception hardware. Although specially developed hardware is quite expensive, DVB-T sticks at around US$ 20 offer a very convenient entry point into SDR, as long as they use a Realtek chipset (RTL2832U). 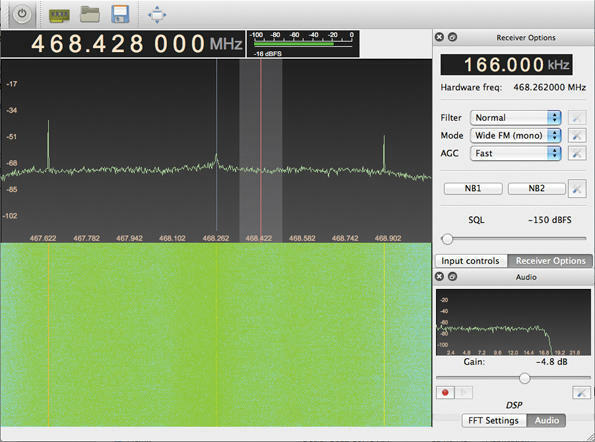 The whole thing operates under the RTL SDR umbrella and relies on Librtlsdr library. A look at my weather station shows that it receives data on 868MHz. Online sources list various chipsets and the frequency ranges they cover. On the recommendation of a colleague, I bought a Terratec Cinergy T Stick RC with Elonics chipset that covers the largest frequency range of the listed DVB-T receivers – and that includes the weather sensor’s frequency. The hardware cost me US$ 25; a rod antenna is included. The basis for the installation was a netbook with Mint 15; the GNU Radio Framework helped to analyze the received radio signals. This kind of kit even includes a graphical editor and supports raw data signal processing (optionally also in realtime) to create a target format with the help of various filters. The software automatically generates Python code that processes the data. installs RTL SDR on my computer. Gentoo and Arch Linux include prebuilt packages; on Ubuntu, you can install the software from a PPA (see the “GNU Radio from a PPA” section). Building the software from the source works with cmake, but there’s a catch: RTL-SDR uses the libusb library to communicate with the stick. However, when certain drivers are loaded, the software fails to correctly talk to the stick. My Mint system loaded the modules from Listing 1. Listing 2 shows a guide from the website  for building the software from the source code. The demodulator rtl_fm takes 200,000 samples per second on a frequency of 98.5MHz (the frequency of a radio transmitter). The aplay command plays the data stream on stdout at a rate of 48kHz. Because the raw audio file does not contain header information, aplay reads the data at this rate and encodes it with 16-bit in little-endian format. To scan larger frequency ranges, you will need a program like Gqrx, which offers a practical front end, visually processing the data to create line and waterfall charts (Figure 2). Figure 2: Representing frequency data with Gqrx. Because the right frequency is printed on my weather station, luckily, there was no need to search. When I set the frequency to 868MHz, I could hear pops every few seconds; I recorded and then analyzed these transmissions with the Audacity audio editor. Importing the data resulted in the test image from Figure 3. Figure 3: Zooming in on one of the peaks in the data with Audacity revealed the chart shown in Figure 4. Figure 4: Use a script to decode the bit pattern shown in Audacity. In fact, the magnified view revealed a pattern. I now had to decode the signal to read the temperature and humidity. An Internet search showed that someone had already done this work. Christophe Jacquet’s Pydemod package assumes a 16-bit preamble, consisting of 1010101010101010. Following this, a sensor (see the Pydemod website) sends 17200 baud signal using on-off keying. For a rising curve, as shown of Figure 5, 1 is transmitted, while a 0 is sent for a drop. To discover whether the values are rising, evaluate the ratio of the numerical values of the samples compared with the baud rate. Figure 5: Finally, the correctly demodulated signal. My initial tests, which evaluated data from rtl_fm using decode_tfa.py, remained inconclusive. Unfortunately, Christophe’s records did not indicate how he called rtl_fm to obtain the raw data for the analysis. Also, the screenshot of the received data in his blog looked very different from mine. My samples were created with the wrong modulation method. The transmitter modulates the amplitude not the frequency. It is therefore necessary to run rtl_fm with the -M parameter. My transmitter sends the data at 9600 instead of 17200 baud. The data preamble was not 1010101010101010, but 101010101010101010101010, so it was actually 24 bits instead of 16. I found another difference between my test system and Christophe’s data: His radio reception system, a FUNcube dongle, supplied the data in big-endian format; the DVB-T stick used in my test, however, used little-endian format. Christophe had to adjust the section code that transforms the raw samples to numbers for further processing. The temperature coding remained the same in both scenarios. Three nibbles (4 bits) encode a temperature digit in BCD (Binary Coded Decimal), where the third digit shows tenths of a degree. My temperature sensor added 40 to the temperature reading, presumably to handle degrees below zero. The next 8 bits then encode the humidity. It detects a data peak when the numerical value of the sample exceeds a limit. This currently limit is set to 4000, but you can change it – depending on the transmitter output. The data can also be present in raw mode, that is, without a WAV header, but at the moment, the rate must be 160,000 per second. The length of the preamble is managed by a separate parameter. You can adjust the baud rate for the data transfer. Listing 3 shows the output from the command. From time to time, the measurement data is faulty. You can detect a problem because a checksum is included, and its expected value and determined value are output. If the expected and determined values deviate from each other, a measurement error has occurred. Extreme temperature jumps are actually impossible; however, two measurements can differ by more than 1 degree Celsius. Tuner gain set to automatic. In practical tests, we found that the antenna should not be too far from the receiver. Even at a distance of 5 meters, the peak value dropped significantly in my tests. If the value is too close to the noise, the script cannot detect the beginning of the data. The Python script outputs the minimum, maximum, and average values at runtime. However, in a practice test, it happened again and again that the deflection returned by the stick was too weak. This problem might be due to automatic signal amplification. You can either fix the value using the -g value parameter or unplug the stick and plug it back into the computer. With very little financial outlay and, ultimately, very little software, you can solve the problem of reading data from a weather station and converting into a digitally processable format. The base station of my test device also receives data with weather and pollen forecasts via the legacy pager network. You can receive and decode this pager data using the multimode-ng tool. The pager data is sent in plain text, but the string encoding is still undocumented. A big thank you goes to Christophe Jacquet for the modifications to his script that allowed for real-time streaming. Konstantin Agouros works for n.runs AG as a consultant for network security. His focus is on cellular networks. His book DNS/DHCP is published by Open Source Press. When he sees vapor trails in the skies above the Lower Rhine area, sys admin Charly Kühnast doesn't just dream of faraway places. With a Linux system and a DVB-T stick, he grabs the signals from jets flying overhead and tracks their courses on a map.